The door trigger device (which uses melting ice to release a weight which opens the door) was installed this morning at approximately 8:30 am by DGIF biologists. DGIF personnel and volunteers took up positions around downtown Richmond to watch for the young bird’s first flight once the pen was opened. At 11:12 am the ice melted and the door swung open. The adult female immediately responded flying to the ledge followed by the adult male. The chick however did not seem interested in exploring the world outside the pen. Over the next several hours the chick remained perched in the nest box, occasionally venturing into the pen, but never leaving its confines. The adults continued to fly from building to building – often flying over or landing on the nest ledge. Shortly before three o’clock she finally left the pen and eventually hopped onto the ledge, raising hopes that we might see her fly. She spread her wings and called to the adults – but no flight. 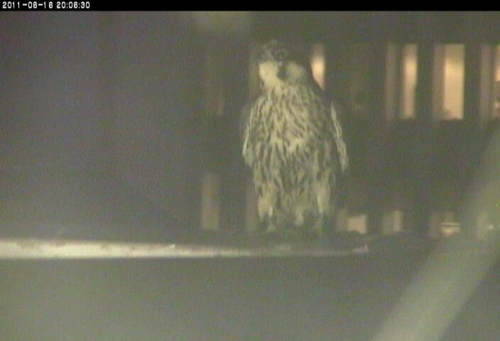 Shortly after 5 pm the adults brought in a meal while a somewhat reduced monitoring crew continued to keep tabs on the chick. As night fell it became apparent that this young female wouldn’t fly today. She is spending her evening walking the ledges as you can see in the photo below. DGIF personnel will be on hand at first light tomorrow and along with volunteers will monitor tomorrow to ensure that her first flight is a successful one.